Learn the meaning of 'nutmeg' in soccer and 17 other strange terms used in sports. When you chat with your teammates it might sound like you're speaking another language. Sure, basketball players understand what you mean when you say you "dropped a dime" during your last game, but average folks probably don't get it. Same thing goes for the soccer players who "nutmegged" their opponents on their way to a goal. To help connect you to the athletes toiling away in other sports, we rounded up 18 of the head-scratchingest terms in sports. Let us know onÂ TwitterÂ if we missed any! When you chat with your teammates it might sound like you're speaking another language. Sure, basketball players understand what you mean when you say you "dropped a dime" during your last game, but average folks probably don't get it. Same thing goes for the soccer players who "nutmegged" their opponents on their way to a goal. To help connect you to the athletes toiling away in other sports, we rounded up 18 of the head-scratchingest terms in sports. Let us know on Twitter if we missed any! What It Means: After you remove your oar from the water, you flip it so it's parallel with the water as you prepare for another stroke. If you fail to remove the oar in time, the blade acts like a brake, and the handle whips back toward you. Violent crabs can actually eject a rower from the boat. Not exactly the kind of crustacean you want to catch. What It Means: When a runner "bonks," he or she has hit the proverbial wall. When you bonk, you have run out of energy, and each step seems harder than the last. You can expect a runner's performance to dip significantly after he or she has bonked. Proper pre- and intra-race nutrition can help runners avoid this. What It Means: A frozen rope is a hard line drive hit directly to the outfield by the batter. The straight trajectory of the ball resembles the name—"a frozen rope." What It Means: A dime is an assist. You might hear basketball players say something along the lines of, "He scored 15 points along with 10 dimes." Steve Nash thinks that a dime came to be synonymous with an assist due to the use of payphones back in the pre-historic era. If you gave someone a dime, you were giving them an assist to make their call. In the basketball world, it's a popular enough term to have inspired the title of a basketball-centric magazine: DIME. What It Means: Slang for a lacrosse stick. It definitely looks like a huge version of the thing you scoop cereal with. What It Means: A soccer player can "nutmeg" an opponent by kicking the ball between his or her legs, then sprinting around the defender and regaining possession of the ball. It's an effective move both tactically and emotionally: "nutmeg-ing" your opponent can give you a serious mental edge. There are a few reports about how this term came into use, but the most likely one suggests that it was born from nutmeg exports from America to England in the late 19th century (it's old, we know). In the trade, sellers would place wooden nuts into sacks along with real nutmegs, tricking the buyers into paying extra for essentially nothing. Nutmegging someone suggests smarts on the side of the seller and stupidity on the side of the buyer. What It Means: We'll wait for the giggles to subside before we jump into this one. Fartlek training is a Swedish methodology for runners—it literally means "Speed Play" in Swedish. The athlete sprints at maximum intensity, followed by periods of easy jogging. There are no standard rep or set schemes: athletes must be honest with themselves to see what they can handle and adjust accordingly. What It Means: A deke is a hockey fake-out, in which the puck-handler uses quick, controlled movements with the puck to get around his or her defender. It's similar to a basketball player performing a successful crossover. It is allegedly a shortening of the word "decoy," originating from Canada (would you have expected anywhere else?). What It Means: Icing occurs when a team calls a timeout right before (in football) the opposing kicker is set to attempt a (usually critical) field goal and (in basketball) right before an opposing player is set to attempt a foul shot. It's done to psyche the kicker or shooter out, which would theoretically make him or her more likely to miss. The jury is out on whether this actually works. What It Means: You might not always realize it, but there is generally another guy on those dunk posters lining the walls of your childhood bedroom. You posterize your opponent when you perform a dunk so emphatic that the moment is put on a poster. Jason Terry can tell you all about it. What It Means: In hockey, the 5-hole is the space between the goalie's legs. A player can score in the 5-hole by slipping the puck past the goalie's leg and stick. What It Means: This is an acronym for "Face Off, Get Off." A FOGO player is on the field just for the faceoff, after which he or she returns to the bench. 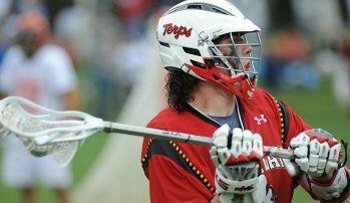 What It Means: This isn't a move, but a look: when a lacrosse player wears his hair long and it flows out of the back of his helmet. Loosely referred to as "lettuce" or "flow, it's an integral part of becoming a "total lax bro, dude." What It Means: "The ball don't lie, man." If you feel you were unjustly called for a shooting foul, a missed free throw by the offensive player affirms that you are, in fact, correct. Former NBA player Rasheed Wallace could often be heard shouting the phrase after being called for a shooting foul. What It Means: A stinger occurs when a player tackles, or is tackled, in a way that squeezes a nerve and sends a stinging sensation down the player's arm. It's extremely dangerous. What It Means: An ace is a serve that is not returned, thus granting the server a point without any subsequent volleys. What It Means: Pepper is a popular warm-up among volleyball players. It usually consists of two athletes performing the following sequence of movement: bump, set, spike, repeat. What It Means: A deuce in tennis occurs when the score is tied at 40-40. A player must score twice in a row to win the match, hence the term "deuce."